I'll pray that everything goes smoothly. Take her out for a walk! Best wishes and enjoy. May not be long-often Mums will have a flurry of energy just before the baby comes. Just a note-our daughter jokingly refers to her brother's birthday as the day we ruined her perfect only child existence. Nontheless they were very close as children, rarely fell out, and as adults still have a strong bond. I'm close to my brother and sister so I always wanted my children to have that bond with their siblings. I'm not sure my little girl will agree when she has to share us! Well she hasn't done the mad clean bit yet, would be nice if she did though! Nesting instinct! Just before having Compostgirl I decided to do the ironing mountain, after I had cleared out the barn. The ironing mountain(S) are still there but it can hold on forever! Best wishes to you and yours. 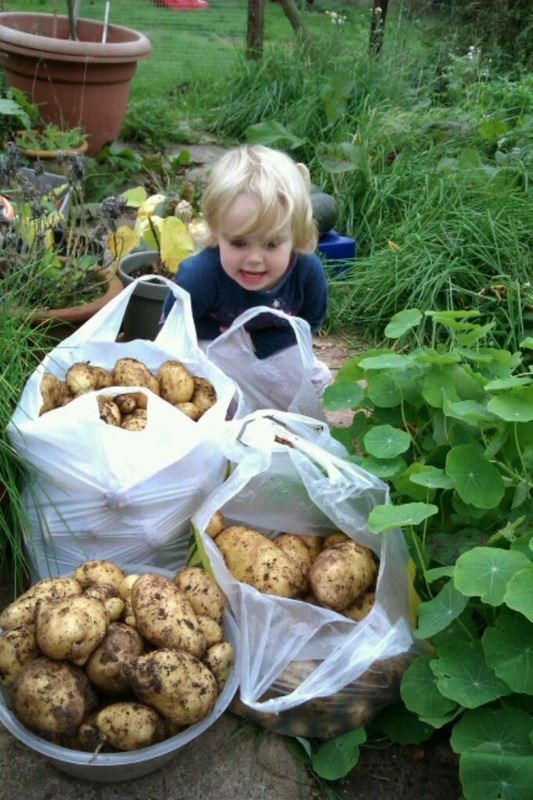 Good potatoes crop. Thanks! The potatoes should have come out the ground a while ago now really, I'm surprice the slugs haven't destroyed them! Lovely looking potatoes! Hope the baby comes soon. Hope it happens soon, I remember the waiting and waiting for our first, she was 10 days late. 33 years ago and still remember how fed up I was! I think she's startuing to get fed up now! The first one was early so we were expecting this one to be! It's now the 10th. Anything? 12th now and still nothing! Hope all goes well. Will be thinking of you all.